Redistricting Affects Black Voters Disproportionately Same for Hispanics? 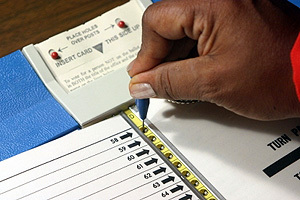 Research reveals African Americans less likely to vote after redistricting. What if you went to vote and your incumbent member of Congress was not on the ballot as expected? You did not move; your member of Congress is alive and well and running for re-election. What happened? Redistricting—the redrawing of political lines, a.k.a. gerrymandering, is the likely culprit. In their article, “The Intersection of Redistricting, Race, and Participation” published in the American Journal of Political Science Danny Hayes, assistant professor of government at American University and coauthor Seth McKee found that redistricting has measurable and statistically significant effects on the political participation rates of African Americans. Their research showed for the first time that the voting rates of African Americans are affected more strongly than other groups as a result of redistricting. Why and when does redistricting occur? Every decade after the U.S. Census congressional districts are redrawn to apportion the 435 seats in Congress to reflect population shifts. However, the frequency of redistricting is happening more often on a statewide basis depending on how the state legislature handles the process. It’s an elaborate game of political musical chairs where the rules favor the state’s majority party. Combing through reams of precinct data, employing regression analyses and using geographic information system (GIS) data from the U.S. Census and states, Hayes and McKee examined more than 65,000 precincts over 11 elections in the five geographically diverse states –California, Florida, Georgia, North Carolina, and Texas. The defining measure for Hayes and McKee’s research was “roll off.” Roll off occurs when a citizen votes in a top ticket election —presidential, senatorial, gubernatorial—but fails to vote in races further down the ballot, like contests for the U.S. House of Representatives. Their research revealed that the consequences can be positive in some cases and negative in others, depending on whether the member of Congress representing the district is African American. If the member of Congress is African American, then African-American voters in the redistricted area can be mobilized and participate through voting. However, if the African-American voter is redistricted into a district represented by someone other than an African American, roll-off could be as high as 8.3 percent. The conclusion reached by Hayes and McKee is “when there are no black voters in a redrawn precinct, average roll-off is 3.9 percent. But when the precinct is 100 percent black, roll-off increases to 8.3 percent, a shift of more than four percentage points.” Since elections can be determined by fewer than four percentage points, the findings are “substantively significant,” says Hayes. “Redistricting suppresses black political participation when blacks are redrawn into nonblack incumbent districts, but reverses that effect when African Americans are redrawn into black-represented districts,” the authors write. Because so little was known about whose participation rates were affected by redistricting, Hayes’s and McKee’s research reveals the “hidden” role redistricting plays on black participation in congressional elections. Their research also shows that there are “information costs” when redistricting occurs, which fall disproportionately on African American voters. Hayes and McKee believe their methodology could be used to test redistricting’s effects on other minorities. “The growing Hispanic population is prime for examining the effects of redistricting as this group is becoming increasingly influential and viewed as a determining factor in the ability to win elections,” says Hayes.